If your condition does not require intensive one-on-one attention, group reformer rehab classes may be a good fit. These classes focus on joint stability and spinal mobility, while building core strength. You will still have the full attention of your instructor to make any adjustments necessary and to ensure that you are engaging the right muscles in each exercise. In these classes your instructor will teach your abdominal exercises while maintaining a “neutral spine” position rather than going into spinal flexion. Neutral spine abdominal work is recommended for clients with osteoporosis, osteopenia, previous spinal fractures and those with herniated discs. But even without spinal flexion, you can still learn how to move from your core safely with the supervision of your instructor. 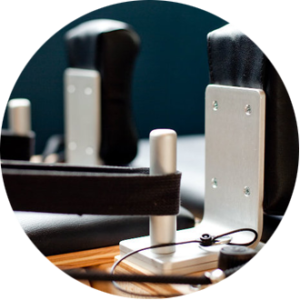 Please note that we require you take one private session on the Reformer equipment prior to allowing you in group classes to ensure that you know how to use the equipment safely. We offer a discounted price that saves you $100 for your first 5 privates ($250 for 5 or $50 for 1). Please make sure you schedule this private session and get instructor approval before enrolling in group classes.